SolarVenti SV-14: My cabin dream was realized in Easter 2018. Everything went well and I was promised a Sjövegan log cabin without water and electricity from 1968. At my first visit after taking over, I noticed that the cabin was compact and that the indoor air was moist and raw. Linens, curtains, furniture and anything that can contain moisture had just that, was humid and raw. The heating process was slow and it took an unreasonable time to bring the temperature to an acceptable level and make the cab dry. Something had to be done, indoor climate is Alpha and Omega, so I started a long process of considering options for remedy. Many hours were spent evaluating different solutions for a better indoor climate. Everything from extractor hoods to solar powered fans and solar collectors, dehumidifiers of all kinds and a handful of drug advice . The choice finally fell on a solar collector, but which one should I choose? At one time I found the Danish-produced SolarVenti on a user platform, nothing bad said about that, relatively cheap investment and, not least, good experiences from those who have this system (see for example: www.hytte.no/ test-solarventi.html ). In addition, in contrast to their competitors, SolarVenti has a set of scientific data / results to showcase and, in particular, a local supplier in Multi-Leisure. 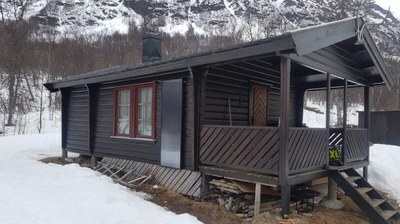 I finally went for an SV-14, albeit oversized to a cabin of 30m2, but we are in northern Norway, and nobody has ever complained of excessive dry and free-heated air in a cabin there. I did the installation myself, and it all went smoothly with a 133 mm hole drill, everything was in place after a couple of hours. The solar collector was pointed southeast, the exhaust valve in the opposite corner and the regulator over the window shade, well hidden behind the curtains. Now, all I could do was to wait and see the effect, in theory hot and humid air should now blow in, create an overpressure and squeeze damp, cold and ugly air from the opposite corner, in other words, circulate and dehumidify the air throughout the building. I returned to the cabin after six days to check the result, it had been snowing all week, and the thermometer showed 1.6o degrees C in recent days, far from ideal weather for solar collectors, so the expectations were quite low. But what a sensational difference, 12o degrees C dry and delicious indoor air with a fresh smell of log cabin and no basement smell. Neither bed linen nor furniture, nor even the floor mat at the entrance, had traces of condensation or moisture. Warming up the room took only a moment, and I swear that I used much less wood to get the temperature near 20o degrees C, I think the chimney vent was also improved (gauge pressure). Simply an amazing result in such a short time, especially considering the weather conditions. The task has been completed and if mother is satisfied, it must be damn good! SV14 for wall mounting: Last autumn I installed a SolarVenti SV14 on my weekend house in the mountains (in a height of 920 m). The effect is amazing. Throughout the entire winter the temperature never dropped below 2˚ C – and now that it is spring the temperature in the house is permanently around 10-12˚ C (6-8˚ C higher than during the same period last year). When we arrive in the weekend house and turn on the heat, a room temperature of 22˚ C is reached easily and fast. I am very satisfied with the product. SV14 for roof mounting: Dear Hans Joergen Christensen. Having purchased an SV14 for roof mounting on our 60 m² summer house we now receive a welcome heating supplement – especially during the spring and autumn periods. At the same time the SV14 improves the indoor climate during the cold winter months when it supplies partial heating to the otherwise cold house and replaces the still air with fresh in a natural way. Indoor we measured the incoming air to be 24º C when the outside temperature was only 0º C! A pity that the knowledge of this air based solar collector is not more widespread as so many people could benefit from its qualities. It is a brilliant product which certainly lives up to all the promises made, and it is highly recommendable for many purposes. Soendervig: We are the happy owners of a summer house by the North Sea. We only use the house during the summer season. Some years ago we had air valves made in all the rooms as the house smelt stuffy in spring. It helped a lot, but we were not completely satisfied. Through a friend we learned about the dehumidification system from “Aidt Miljoe”. We drove up to Aidt. Looked at the system and bought two medium sized which we immediately installed in the summer house. Only 6 weeks passed before we noticed a great improvement of the indoor climate. We can only recommend the dehumidification system from Aidt Miljoe . Best regards from Inge and Poul Hjorth, Soendervig. 2100 Copenhagen … I’m very satisfied with my SolarVenti. The system meets my highest expectations. The indoor climate of my house is quite different now – no damp and no stale “summer house smell” – everything is just fresh. Log house: We cannot but praise The SolarVenti. It is a fantastic invention. One year ago we bought a log house. We knew from the start that there were death watch beetles in the woodwork – they have disappeared completely – the house smells fresh and nice even after the winter. All cupboards and drawers have been kept open throughout the winter period. Even the bed linen smelled good!! It has been and still is a fantastic invention. Many kind regards from Lilli Larsen. Hi SolarVenti… We bought an SV3 solar collector for our caravan just before easter. We have now installed it by the kind assistance of your customer service. The air passes through the cooker hood, so I avoided drilling an extra hole in the caravan. It runs just perfectly and supplies fresh warm air into our caravan. On a sunny day we have measured 22º C and 45% air humidity in the van. Please let us have the solar collector before the end of May as we will start laying our new roof then. Kind regards, Torben Lynnerup, Aalborg. Kastrup: It is impossible to praise your large system (SV14) enough. It has now run for three years to our complete satisfaction, and we are very pleased with it whenever we stay in our holiday home. Kind regards, J.P.Skov Jacob Appels Allé, Taarnby. 2610 Roedovre: Our SolarVenti has now run for a year, started in summer 2002, autumn, winter and now spring 2003. The SolarVenti works far better that we had expected. We used to hang up 4-5 moist removal bags in our 40 m² house, but the house was still cold and damp in winter. Broager: Christian Brock, Rugtoften 18, 6400 Soenderborg writes: For your information I want to tell you that it is the best investment I have made in my summer house. We use the house every weekend all year round and never arrive to a house filled with damp. If you need a reference in the area around Flensborg Fjord you may use my name. The address of my summer house is: Agertoften, Brunsnaes, 6310 Broager. 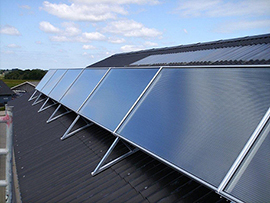 Fjellerup: We write to tell you how pleased we are with our solar heating system. We installed it in our summer house and will not do without it. The house is dry and smells fresh, and when we arrive there on a day during autumn or spring we clearly notice that the temperature is a couple of degrees higher inside the house than outside. So we only need a stick in the wood stove to get the house heated. Valborg praises it whenever she gets the chance, and she is happy that the furniture, linen and tableware are never damp. Even when we use the wood stove there is no condensation anywhere. Of course you don’t remember us, because we had the system installed many years ago. We were among the first, I believe, so it is many years ago. I suppose you do not notice how time passes when everything runs smoothly. We have not touched the system since we mounted it. We read that you have developed the system further and therefore we felt inclined to tell you how happy we are with our antiquity. If anybody in the Fjellerup area would like to see it they shall be welcome to drop in. Kind regards, Valborg og Leo P. Larsen Hinnerup. Both damp and smell have disappeared completely! I installed an air based solar collector… What makes it so brilliant is that the fan is powered by a separate solar cell so that air is only blown into the house when the sun shines making it possible for the warm air to absorb the damp inside the house. Both smell and damp have disappeared completely as the system runs both summer and winter. It has now been working for four years on free solar power. So it is a solution which I can warmly recommend. Skive: In week 39 I ordered an air based solar collector incl. solar cell and fans. The delivery was prompt only 3 days later and during the weekend 30/09-00 I mounted the system – easily and simply. The system was installed on the roof of a small annex from 1942 which is situated adjacent to our home. The two store annex is 35 m² with an open staircase up to the top storey. The air intake is led down to the ground floor in the corner as far off from the staircase as possible. The annex is used by my daughter and heated by a combination of electric heating and wood stove. The insulation is OK but there are no windows facing north and not much light/warmth coming in from the east or west. So the climate is not optimal, but even now when the system has been working for about 10 days only, we notice a significant improvement of the indoor climate. The system does not produce any noteworthy heating supplement but the tempered air renewal is certainly worth the money. Wooden summer house in a plantation: We own a wooden summer house located in a plantation. The optimal sunlight is ‘only’ 4-5 hours a day, but in spite of this we have got at ‘new’ house. We started out with huge damp problems, water on the inside of the windows, moist bed linen, stale air even though this is a non-smoking house. Jens Lassen: I can only encourage others to have an air based solar collector (SolarVenti) installed. The benefits are so many! I feel inclined to compliment you on the high quality materials used – they are superb! A month has now passed since the installation, and encouraged by several periods of fine sunshine I wish to report that the it runs perfectly and to my complete satisfaction. You should not hesitate to recommend such systems for the venting of other basements – even though, of course, a suitable place facing south and an inlet of the air down into the basement will be needed. The air is sucked in through the chimney which was used for a furnace 10 years ago. As expected there was a slight smell at the beginning but after a week it stopped. The air now seems quite fresh. So once again – our best recommendations and thank you for all the fine work you have done with a quality product. The power bill from NOE was halved: Not only did the Taulbjerg family halve their power bill in their summer house in Gjellerodde after having installed an SV30 from NOE. The family also had the indoor climate improved both summer and winter. The surplus heating in winter is led into a shed where the tools have never been better: Egil Taulbjerg from Holstebro says that his family has used electric heating in the summer house since 1966. The total power bill has normally been € 1,500 – € 1,600 a year in the 110 m² summer house. Half of the power bill covered the amount spent in order to keep the house frost free during the winter season. – We have heated the house with electricity all year round. Even though we haven’t used the house very much during the winter period. With the SV30 we still heat the house all year round. Even in the very cold period we have almost free hands to decide the temperature of the house just by using the solar heating. Even during the coldest period this winter there was 8º C. And we were still repaid € 770 that is half of the total power bill. Such a reduction means that the about € 2,200 paid for the SV will be returned in three years. And he adds that if there is a very cold winter with long periods without any sun the temperature in the house may fall to a few degrees Celsius – but never below zero. Always nice to move into. The family, of course, is more than happy to save money. But for them it is just as important to be welcomed by a warm and dry house even if the temperature is 30º C below zero outside. – We feel that the indoor climate has improved. Fresh air is blown into the house from outside. Our summer house is made of wood, and I believe that the heat inside helps drawing out moist from the wood. The result is that it will last longer, says Egil Taulbjerg. The family is so satisfied with the system that they have installed two more. One in another summer house in Kollund and one in a hunting cottage without power installations. I bought an SV30 from you a couple of years ago. I have just had some craftsmen doing various jobs on my summer house. They worked there in December and January and were very surprised by the fresh air in the house. No stale old summer house smell. I, myself, have now worked there for several weekends. The sky has been clear most of the time and the SV30 has blown fresh air with a temperature of 46º C into the house when the outdoor temperature was 3ºC, that is an increase of more that 40º C.
We have shut off the heaters on the days when the sun was shining. Kind regards, Olaf West, summer house in Soendervig.